Policymakers continue to struggle to figure out how to turn a troubled bank into a good bank and a bad bank. Under the good-bank/bad-bank policy, the good bank will operate free from concerns about troubled assets, because these assets will be held by the fully independent bad bank. Most discussions of the separation of a bank in this way presume that the government must inject a lot of new capital to create a well-capitalized good bank together with a still-solvent bad bank. The math seems simple – the troubled bank has almost no capital, so if the capital has to be split between the two banks, a well-capitalized bank will need new capital. But this math is incomplete. We can create a good bank with a big cushion of capital while keeping the bad bank as solvent as the existing integrated bank. The key idea – from Jeremy Bulow – is that the bad bank owns all of the equity in the good bank. Now one might wonder, given that the intrinsic claims of neither the bond holders nor the equity holders has changed, why bother? Pundits talk about the toxic assets in the banking system as if somehow they were infectious, and the good assets would become infected by the bad assets. One envisions the mould on one piece of cheese taking up residence on an adjacent piece in the frig. Or that somehow if the bad, hard-to-value, assets were moved somewhere else, both sets of assets would be easier to value and the banking system somehow more sound. We don’t think the bad assets are infectious. Nor do we think this re-arrangement increases or changes values or facilitates the valuations of the assets behind the banking system. What the change does do is make ever-so-clear what the priorities are in an insolvency. Note that in this re-arrangement, the debt claims, including the short-term commercial paper, are direct liabilities of the bad bank. 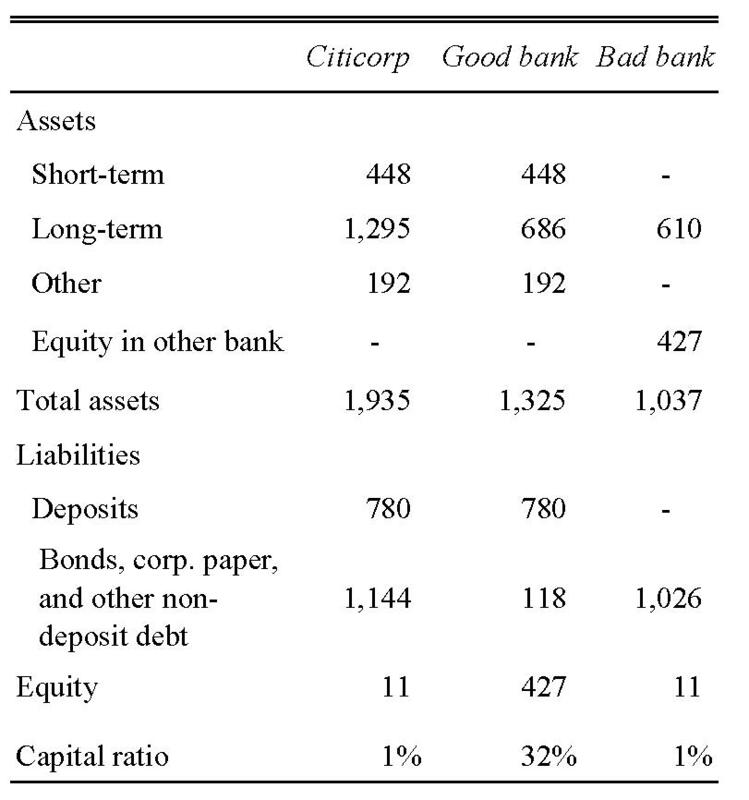 If the bad bank cannot re-fund its commercial paper one morning, the bad bank must be re-organized. Some of its claims must be turned into equity. This is the standard sort of Chapter 11 re-organization. Editors’ Note: This was first posted on the Hall-Woordward blog “Financial crisis and recession”, as The right way to create a good bank and a bad bank, 23 February 2009. Reposted with permission.